I have found the following activities to be good ways of encouraging imaginative play – all tried and tested and all designed to cover the ‘A Unique Child’ aspect of ‘Expressive Arts and Design: Being Imaginative’. Let imaginations run wild – anything goes with these spiky creatures. 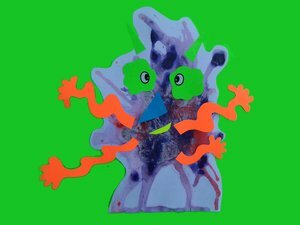 Squirt a small blob of paint onto your paper (try using two or more colours if you want to extend the activity) and use a drinking straw to blow the paint into an interesting shape. Pour any excess water away and leave to dry. 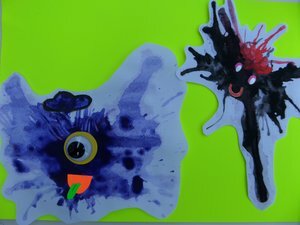 Turn your blobs into imaginative space creatures by adding extra bits and pieces like googly eyes, sequins and glitter or drawing on mouths, antennae etc.